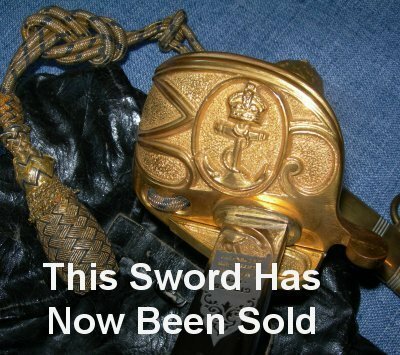 Very good condition George 6th (WW2 era) British naval officer's sword, scabbard and all weather bag by Gieves. In very good condition, this is a well made Gieves (sold Wilkinson swords under their own name) of London, Portsmouth and Devonport. Tiny rust spots to a few areas of the blade (can not really see them unless under close inspection - I have now applied preserving wax to prevent any further rust) and a little streaking to the last tip area, but otherwise worthy of active service. 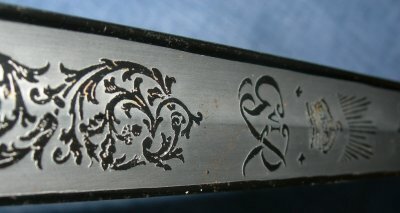 31 3/4 inch straight blade very nicely etched with George VI's royal cypher one side and the traditional fouled anchor the other. 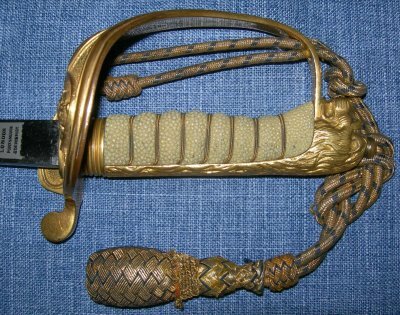 Blade firm in the hilt, fishskin and wire bindings (twisted grip wire) in very good order, gilt still bright, sword knot in good order, folding section of guard locks onto scabbard pin as it should, scabbard leather a little faded, the gilt fittings a little dull, the all weather bag sound if a little worn and tired as you would expect.